Before we talk about the food associated with Valentine’s Day, we need to talk about the history of the day itself. Like many holidays, the origins of the day we set aside to celebrate love are murky. Historians believe the day is named after a Roman saint (or possible more than one), named Valentine. One legend says Valentine was a physician who fell in love with one of his patients, the blind daughter of an emperor. Prior to his execution (due his religious beliefs), he sent a note to the girl and signed it “Your Valentine.” The story goes on to say that the blind girl was miraculously healed and able to read Valentine’s letter (unfortunately after his death). Now that we have the history out of the way, let’s start talking about Valentine’s Day food traditions. 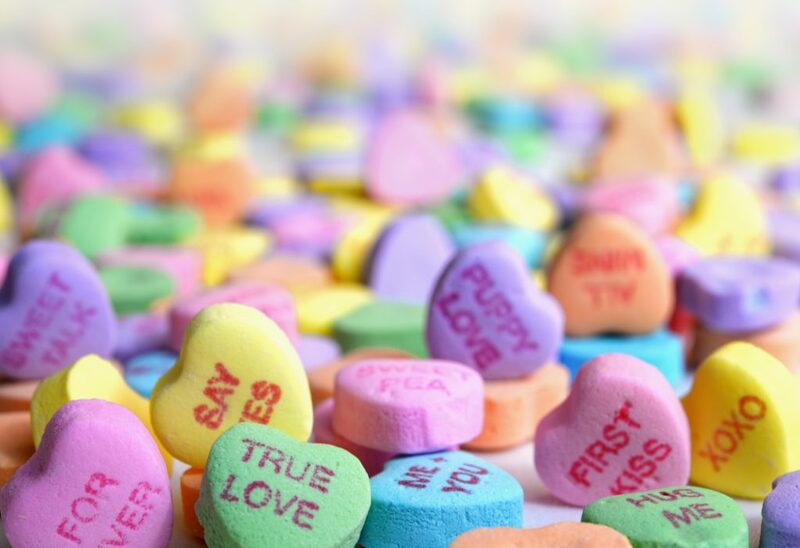 When asked which food they associate with Valentine’s Day, most people think of chocolates. However, there are a few more foods besides those sweet treats that have traditionally been used to celebrate both love and Valentine’s Day. Herbs – Basil, lavender, and rosemary are the three herbs most associated with Valentine’s Day. Basil is a traditional symbol of fertility and was often worn by women to signal their single nature. The scent of lavender is not only relaxing, it is said to be an aphrodisiac. Rosemary has long been a symbol of love, with it being used frequently in wedding bouquets during the Middle Ages. Wine – The warm feelings one gets upon drinking a glass of wine have long been compared to the euphoria of love. This has easily made wine a symbol of the same. If you want to avoid its inebriating qualities, cooking with wine will burn off the alcohol. Honey – Bees are traditionally a symbol of love because of the sweetness of honey and the bitterness of their sting. It’s no wonder that honey is also used to celebrate Valentine’s Day. Strawberries – Their read color and heart shape make strawberries a perfect fruit to celebrate love. Strawberries are also the symbol of Venus, the Roman goddess of love. Dip the fruit in chocolate and you can enjoy one of the most traditional Valentine’s Day foods. Chocolate – We won’t leave out the most popular Valentine’s Day food, even though it one of the more recent additions to the holiday menu. Chocolates became a common gift during the Victorian era. Victorians practiced a romanticized version of medieval chivalry and courtly love. Richard Cadbury (yes, that Cadbury), a chocolatier who worked during the mid-1800s, not only developed a recipe for a creamier chocolate, but also dreamed up the special heart-shaped boxes now associated with Valentine’s Day. 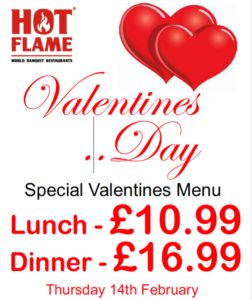 On Valentine’s Day more than ever you want to treat your loved one to something special, their favourite dish . . . a juicy steak maybe or delicate, sophisticated sushi. Or perhaps you want to try something different, push the boat out a little, experiment . . . variety is the spice of life as they say! You can do all of this at Hot Flame Livingston. With cuisines from around the world cooked fresh throughout lunch and dinner services you’re both bound to find something that tickles your fancy. And we have a never-ending chocolate fountain, with strawberries to dip in it! What more could you want?! © 2019 Hot Flame Livingston.